The Dow Jones Industrial Average is up slightly following a better-than-expected retail sales report. As of 1:15 p.m. EDT the Dow was up 7 points, or 0.05%, to 14,475. Meanwhile, the S&P 500 is up 0.15% to 1,555. There were three U.S. economic releases today. Source: MarketWatch U.S. Economic Calendar. The one to pay attention to is the retail sales report from the Department of Commerce, which showed that retail sales rose at their fastest monthly rate in five months, up 1.1% from January to a seasonally adjusted $421.4 billion. Year over year, retail sales were up 4.6%. Retails sales are an especially important metric to watch, as consumer spending makes up 70% of the U.S. economy. Economists had been expecting a gain of only 0.7% as the increased payroll tax and rising gasoline prices ate into consumers' wallets. 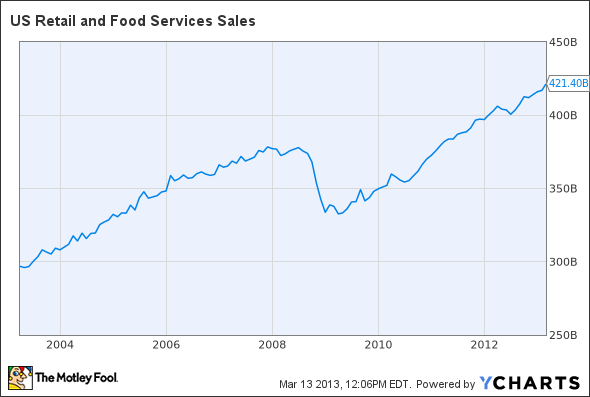 US Retail and Food Services Sales data by YCharts. Spending at grocery stores rose 0.7%, while spending at restaurants fell 0.7%, indicating that consumers are eating at home more. Consumers also spent less money at department stores, on home furnishings, on electronics, and on appliances. Consumers did not slow spending on their cars, however: Automobile sales rose 1.1% in February, showing continued strength for the time being. Spending at gasoline stations rose 5%, reflecting February's higher gasoline prices. Except in California, gasoline prices have not crossed the psychologically significant $4 level at which you start to see consumers trying to limit their gasoline purchases. For the time being, the economy is chugging along slowly. It remains to be seen whether this can continue with consumers cutting back spending in every area but automobiles. Today's Dow leader is IBM , up 0.6% to $211.97 on no real news. IBM was recently ranked No. 24 on The Motley Fool's list of the 25 Best Companies in America; you can read more about what makes IBM one of America's best companies. While IBM's growth has been slowing, there's a lot to like about the company, including its expanding IT products and services businesses. IBM also pays a steady dividend with a trailing yield of 1.6%. The company raised its dividend in each of the past 17 years and could raise it again this year. If you're looking for some long-term dividend investing ideas, check out the Fool's special report: "The 3 Dow Stocks Dividend Investors Need." It's absolutely free, so just click here and get your copy today. The article IBM Leads the Dow on Strong Retail Sales originally appeared on Fool.com. Dan Dzombakcan be found on Twitter @DanDzombakor on his Facebook page,DanDzombak. He has no position in any stocks mentioned. The Motley Fool owns shares of International Business Machines.. Try any of our Foolish newsletter services free for 30 days. We Fools may not all hold the same opinions, but we all believe that considering a diverse range of insights makes us better investors. The Motley Fool has a disclosure policy.